"Expressions of the City: Re-imagining the Local"
Using the romantic allure of Marfa, Texas as a counterpoint, the exhibition, Expressions of the City: Re-imagining the Local, invites the viewer to examine and dissect their understanding of the city and to find a deeper awareness of their interaction with the urban landscape. 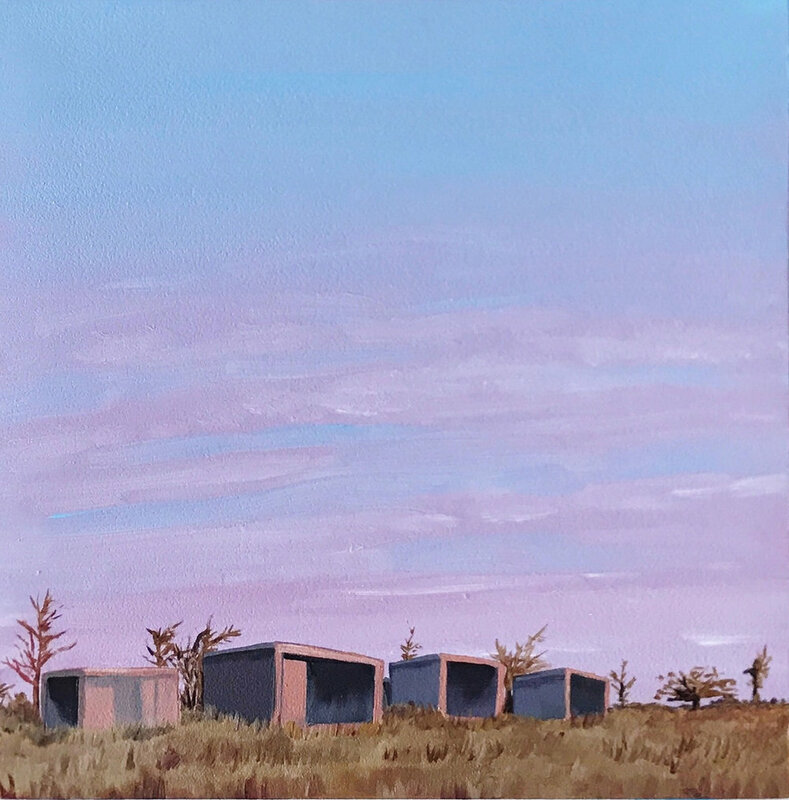 In the same way Donald Judd’s minimalist works attract visitors to Marfa, the mystical skylines of major metropolises across the nation act as a symbol for the heart of the city, but what lies beneath? Is the ephemeral expression of graffiti a sign of social decline or are remnants of urban decay now considered a cultural commodity? The artists within the exhibition have taken to close observation, questioning ideas related to economics, permanence, preservation and the socio-political relationship we have to the history of a place over a period of time. "Terra + Celestial: A Meditation on Color and Form"
Relative to the way the moon and sun are connected to the rise and fall of the ocean tides, we find ourselves looking for a connection to something greater. We also long for a gravitational pull that is beyond our control, an interaction with a medium, that when combined, equates to a synergistic experience that makes us feel complete. In Terra + Celestial: A Meditation on Color and Form, each work within the exhibition exemplifies the artists intimate relationship with the process of art making. Through a variety of materials a visual expression evolves that facilitates a deeper understanding of the self. Nicole Peralta embraces the complexity of personal emotions and an open investigation into her imagination as a way to flush out the frustrations of daily life. Watercolor is a delicate medium, whereby the fluidity of the pigment requires patience, restraint and a deft hand. Working within these technical confines the artist articulates sinuous lines overlapping in cool colors. Many of her compositions are further highlighted with dark contours that emphasize handwritten text or topographical references. Jan Christian Jusino is a native of Puerto Rico that is influenced through the bi-cultural experience of having lived in two very different cultures. The artist finds expression through a more forward color palette and simple, yet bold forms. Jan further grounds his practice by working with three-dimensional geometric wooden shapes incised with multiple lines creating an earthy texture. Rheology is the study of the flow of matter, a science that considers the fluidity of materials in a variety of forms and degrees of viscosity. Similarly, kinesiology studies the mechanics of the human body in relation to physical activity. However, when we move our body in yoga, incorporating breath and mindfulness, we transform a simple state of kinetic movement into something much more transcendental. We flow with the particulars of the energy in the room, and create something new each time we engage in our practice and in community. Artist Kelly Scheid creates work that reflects this unique state of energy. Her process consists of the conscious movement and flow of materials. Through the manipulation of acrylics she strikes a visual cord with a prismatic display of various color combinations, resulting in multi-textured surfaces and original, one-of-a-kind works of art. The work is on view and rotating through March inside Black Swan Yoga Houston, Kirby location. "And They Walked Hand In Hand, Side By Side"
What are the implications of this newfound interest and awareness of what feminism is today, and is it an opportunity to reimagine what it means to be a feminist? This exhibition endeavors to explore and construct new knowledge as it relates to femininity, beauty, cultural identity and our understanding of modern feminism. Furthermore it looks to create a space to engage in dynamic conversation around the issues of feminism so that we grow to collectively acknowledge our strength in numbers when we decisively aim to walk hand in hand, side-by-side. Featuring Texas' emerging student artists from across the state who are actively enrolled in and pursuing a fine arts degree from a Texas College or University. Also included are special works from local artists Jane Ponte and Supér Flaké affiliated with Judith Masliyah and My Flaming Heart - Opening night only! "When I Breathe Out, You Breathe In"
Featuring Texas student artists Jesus Perez and Erin Carty, this exhibition invites the viewer to consider the widening triangular gap between our digital identities, the natural world, and one another. Is there a way to connect what has been disconnected or is there a balance to be found in what rests in between? Multidisciplinary artist Jesus Perez references the act of identity construction vis-a-vis each other and the world around us through his textual innuendos and juxtapositions of color and form. Jesus is currently pursuing a BA in graphic design from the University of Texas Rio Grande Valley, he works as a freelance graphic designer and practicing artist while splitting his time between Houston and McAllen, Texas. Erin Carty’s photographs present the stark tension between what we long for and what is simultaneously out of reach: fresh air, wide open space, and room to breathe. In contrast, her paintings depict that which we are bound to: handheld devices, pixelated verbiage and multi-layered yet incomplete experiences. Erin was born in Hiedelberg, Germany and raised in various towns and cities before settling into El Paso, TX. 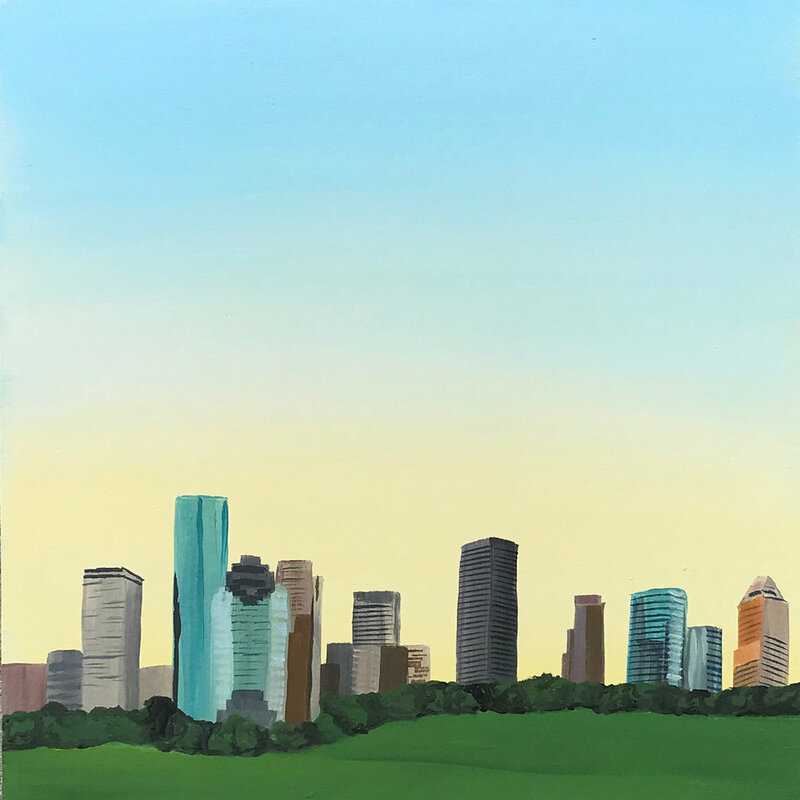 She received her BFA in studio art from Texas State University with a minor in Psychology and is currently a second year graduate student in the MFA program at The University of Houston. ÆTHER SPACE operates within a three month exhibition turn. We are currently accepting submissions for our upcoming exhibition in Late September, early October. See more information on how to submit your work under "contact/submissions."